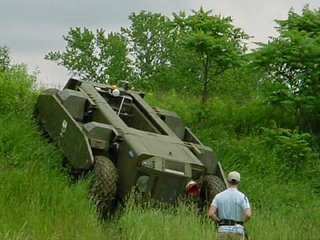 UQM TECHNOLOGIES, INC. (AMEX: UQM), a developer of alternative energy technologies, announced that two additional hybrid electric “Crusher” unmanned ground combat vehicles powered by UQM® high torque propulsion systems and generators have begun field testing by the U.S. Army. The 6.5 ton “Crusher” vehicles are being developed and built by a team led by the National Robotics Engineering Center, a unit of Carnegie Mellon University’s Robotics Institute. The two Unmanned Ground Combat Vehicles (UGCV’s) are greatly upgraded versions of the original 8.5 ton “Spinner” which began field demonstrations over three years ago and was powered by an earlier generation of UQM® propulsion motors and a micro-turbine generator. The 6-wheel drive machine can run on any 'feature rich' terrain crunching anything in its path. It can even flip over and continue to drive upside down. The prototypes are an Advanced Technology Demonstrator that complements the Army’s Future Combat System (FCS). 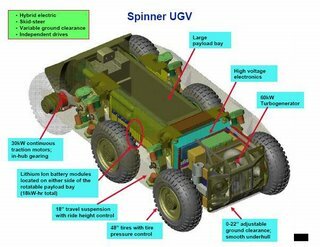 The Spinner is also used as a platform for DARPA's Unmanned vehicle PerceptOR Integration (UPI) project. PerceptOR, for Perception for Off-Road Robotics, tests advanced sensors and control algorithms for autonomous vehicles.